The greatest sprinter in history, Usian Bolt was defeated in the 100m final on Saturday at the 2017 London IAAF World Championships. 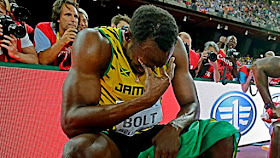 It marked the first final Bolt lost of any kind in over four years, spoiling what could have been a perfect ending to a storybook career. Bolt's world records may remain standing, but he would not accomplish his goal of remaining undefeated in the 100m through the end of his career. Justin Gatlin defeated Bolt in the final, running 9.92 for the gold to Bolt's 9.95. Bolt will return later in the championships to anchor Jamaica's 4x100m team in the hopes of one final gold medal.